Search for the best flight prices from Stansted to Budapest. Compare prices, book today and save money with Stansted Airport. 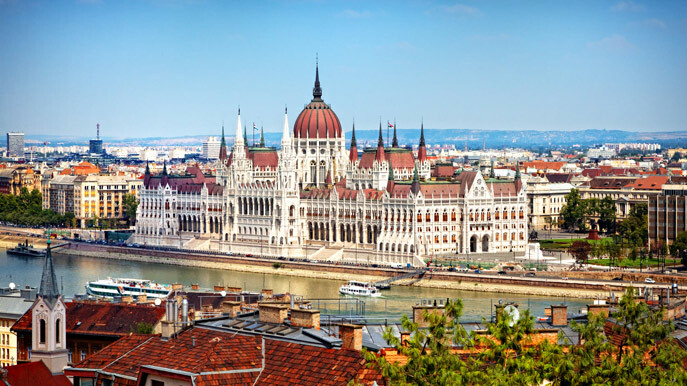 Sitting astride the great Danube River, the iconic twin city of Budapest is a beacon of intense historical value. Wandering through the ancient streets the curious explorer will be overcome with a wealth of inspiring architecture and panoramic views, easily rivalling the tourist capitals of Europe, as well as an invigorating cafe culture and buzzing night life. Budapest is a city full of grandeur, and this is reflected in the Hungarian capital’s top hotels. The five-star Kempinski Hotel Corvinus Budapest (Erzsébet tér 7-8) offers 359 rooms and superb views of the Danube River, while for enchanting vistas of the Chain Bridge, the Four Seasons Gresham Palace (Széchenyi István tér 5-6) can’t be beaten. The Bo18 Hotel Superior (Vajdahunyad utca 18) is a good value three-star option, while backpackers should try the Yep! Hostel (Wesselényi utca 13), located on the Pest side of the Danube. The shopping opportunities in Budapest cover a broad range of tastes, from modern fashion outlets to market halls and shops jam-packed with folk art souvenirs. Browse the designer stores and fashionable labels at Andrássy út (avenue) and Váci utca, or the aptly nicknamed ‘Fashion Street’ of Deák Ferenc utca. Holiday souvenirs and fresh produce can be found at Budapest’s largest indoor market, Nagycsarnok (Fővám tér), or head to Falk Miksa utca for top-quality antiques. Budapest’s eateries are forthcoming in traditional hearty Hungarian fare, such as goulash, dumplings and paprika stew, but the city is also blessed with fine dining and modern options for its visitors to enjoy. The stylish Onyx (Vörösmarty tér 7-8) offers an inventive menu to get stuck into, while those with expensive tastes might want to try the caviar at Arany Kaviár (Ostrom utca 19). Mingle with the city’s locals at any one of the many cafes that pervade the streets, with the coffee and cake at Ruszwurm (Szentháromság utca 7) being particularly good. Budapest has held an edition of this renowned literary festival that hails from the border of England and Wales since 2012. It sees plenty of readings and debates that attract writers, speakers, novelists and poets from around the world. Hungarian folk arts and the multiculturalism of Budapest are the central focus of this music and dance festival that stretches itself across 10 days. There are international flavours to the performances put on by hundreds of participants. Despite only springing into existence in 2011, this beer festival has already garnered a strong reputation. Lasting for four days, there are around 200 brews to sample, all set into the scenic backdrop of the Buda Castle. This festival combines ballet, opera, world music and orchestral performances with interesting exhibitions across three summer months. The open-air stage on Margaret Island is a real draw, but various venues around the city help to play host. The Hungaroring is just a short distance from Budapest, and is the setting for the country’s annual Formula One Grand Prix. Take in the qualifying on the Saturday before Sunday’s race, and enjoy all the attractions of this high-octane circus.